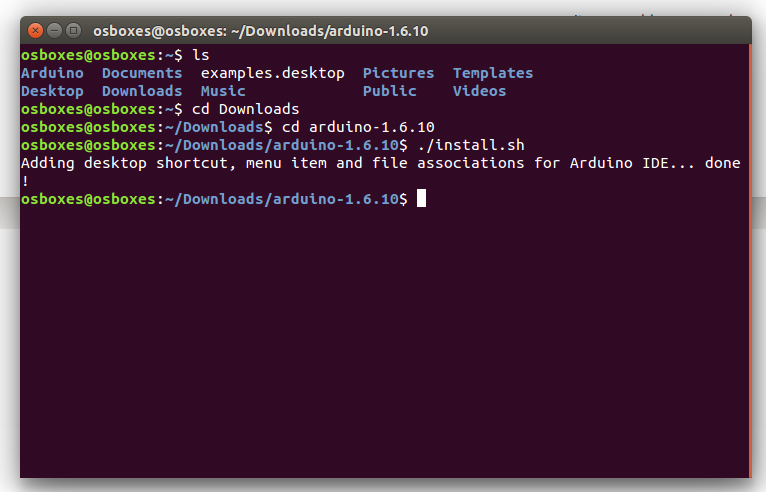 This document explains how to install the Arduino Software (IDE) on Linux machines. The Linux build of the Arduino Software (IDE) is now a package that doesn't require any specific procedure for the various distributions availabe of Linux. The only relevant information is the 32 or 64 bit version of the OS. Get the latest version from the download page. You can choose between the 32, 64 and ARM versions. It is very important that you choose the right version for your Linux distro. Clicking on the chosen version brings you to the donation page and then you can either open or save the file. Please save it on your computer. The file is compressed and you have to extract it in a suitable folder, remembering that it will be executed from there. Open the arduino-1.6.x folder just created by the extraction process and spot the install.sh file. Right click on it and choose Run in Terminal from the contextual menu. The installation process will quickly end and you should find a new icon on your desktop. If you don’t find the option to run the script from the contextual menu, you have to open a Terminal window and move into the arduino-1.6.x folder. Type the command ./install.sh and wait for the process to finish. You should find a new icon on your desktop. When the Arduino Software (IDE) is properly installed you can go back to the Getting Started Home and choose your board from the list on the right of the page. It might happen that when you upload a sketch - after you have selected your board and the serial port -, you get an error Error opening serial port ... If you get this error, you need to set serial port permission. The "0" at the end of ACM might be a different number, or multiple entries might be returned. The data we need is "dialout" (is the group owner of the file). where <username> is your Linux user name. You will need to log out and log in again for this change to take effect. After this procedure, you should be able to proceed normally and upload the sketch to your board or use the Serial Monitor.